Katie was raised in a modest, tight-knit West Virginia family, each evening centered around the dinner menu. Eager to get involved, Katie began cooking at the tender age of 4 under the guidance of her mentor Grandma Dora. Using fresh vegetables from her grandpa’s garden, Katie quickly learned the value of seasonal ingredients. Today you’ll find Katie as the co-host on Food Network’s “The Kitchen”, host of Cooking Channel’s, “Beach Bites with Katie Lee” and she can be seen regularly on Food Network shows, “Best. Ever.” and “Beat Bobby Flay”. Katie is the author of three cookbooks, her latest “Endless Summer Cookbook” was released to rave reviews. She sits on the board of the Food Bank for New York City and is an ambassador for the Wildlife Conservation Society’s 96 Elephants campaign. Cooking is not the only thing Katie is passionate about. Staying healthy and spending quality time with her most adorable rescue Chihuahua-Pomeranian mix named Gus are important parts of her daily life. Katie understands the importance of great nutrition and its impact on daily health, but also believes that nutritious meals can taste delicious too! So, when it comes to feeding Gus, Katie chooses award-winning Nulo not only for its leadership in pet food innovation but also for the company’s wide range of super-premium offerings from high-meat kibble, to freeze-dried raw, organic bone broths and meaty pouches. A culinary master’s dream fit for a Top Dog. When it comes to delicious and nutritious foods and to staying healthy, few people possess the experience and knowledge of Katie Lee. We’re so proud to have her as part of the Nulo family. Watch Katie talk more about her focus on nutrition and staying healthy with Gus in their video above. 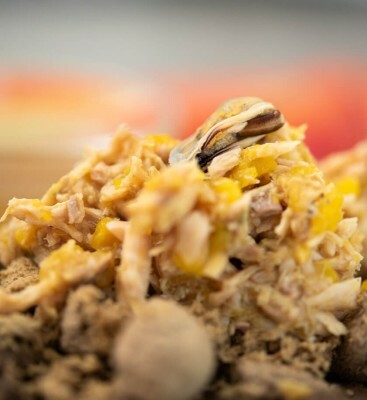 When Katie wants to create a special treat for Gus, she serves this delicious blend of Turkey and Sweet Potato Kibble with Freeze Dried Lamb & Raspberries, Beef Bone Broth, Chicken, Mackerel and Mussel.